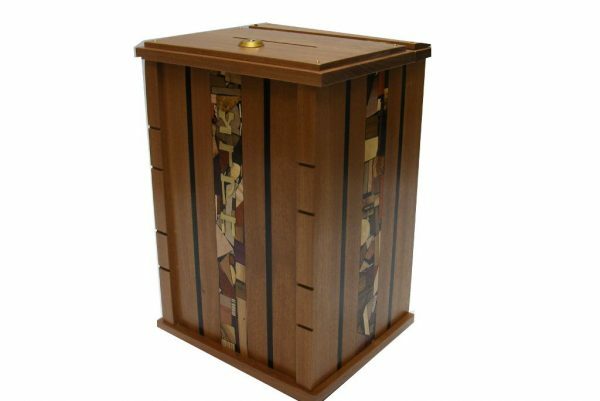 Rich multi wood mosaics frame this synagogue’s logo, hand cut from solid woods, on this synagogue sized spice box. You smell the spices through holes in the top in the shape of a Star of David. Rich multi wood mosaics frame this synagogue’s logo, hand cut from solid woods, on this Synagogue Sized Spice Box with Custom Logo. Each wood shown, is in it’s original color. You smell the spices through holes in the top in the shape of a Star of David. This logo can be replaced with your synagogue’s logo to create a spice box suitable for both large and small hands to hold for the Havdalah Ceremony at your place of worship. 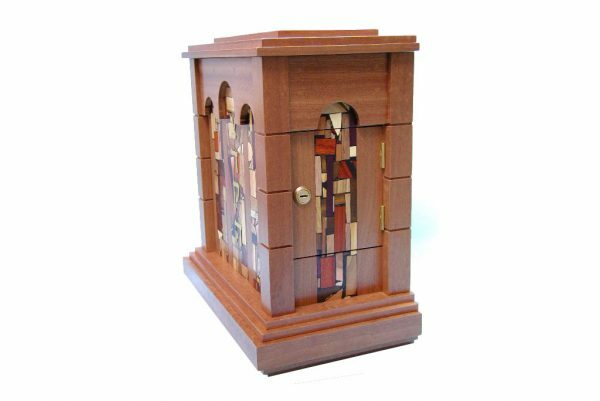 You can also order this spice box along with the synagogue sized Havdalah Candle Holder . These items are great for keeping young and old alike involved in the havdalah ceremony. This is a special order at Etz-Ron and can re-designed to your specifications, and with the woods of your choice. Prices start at $499. Dimensions: 6.7 x 4.3 x 5.1 H ” ( 17 x 11 x 13 H cm) of course this can change!